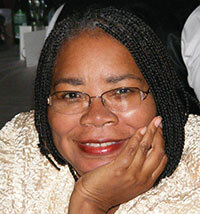 Angela Jackson is an award-winning poet, playwright, and novelist. She is the author of numerous collections of poetry, including the National Book Award–nominated And All These Roads Be Luminous: Poems Selected and New. Her novel Where I Must Go won the American Book Award in 2009. Its sequel, Roads, Where There Are No Roads, was published in 2017. Additionally, Jackson was longlisted for the Pulitzer Prize and a longlist finalist for the PEN Open Book Award for her 2015 poetry collection, It Seems Like a Mighty Long Time. Other honors include a Pushcart Prize, Academy of American Poets Prize, TriQuarterly’s Daniel Curley Award, and the Poetry Society of America’s Shelley Memorial Award. Jackson lives in Chicago.